The National Student Clearinghouse is celebrating its 25th anniversary with a gift for you and your students this fall: more time! With the upcoming release of our Next Generation Transcript Experience, ordering transcripts will be faster and easier than ever. Easy: Intuitive navigation, progressive display and minimal data entry simplifies ordering and improves accuracy. Fast: Up to 50% faster than existing ordering solutions. Mobile friendly: Our mobile responsive design works seamlessly across all devices. 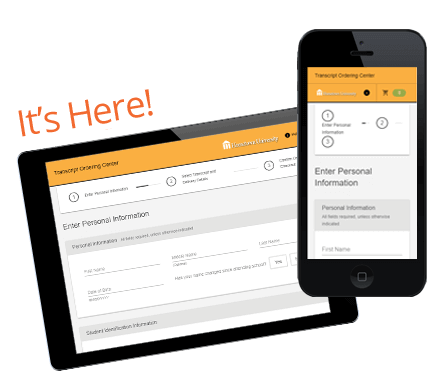 Why wait to offer your students and alumni the fastest, easiest transcript ordering solution? Talk to your Clearinghouse rep about our Next Generation Transcript Experience. If you already participate in Clearinghouse Transcript Services, watch for information on your institution’s transition to the Next Generation Transcript Experience.